This is why there are no pictures of me. There are no photos of me battling ulcerative colitis in my hospital bed. No photos of my stoma. My wasted, 89 pound body. The skin peeling off the bottom of my feet. The blood transfusion. The voluminous amounts of gelatin I ate when my body could tolerate nothing else. There are no images of these things. We didn’t take pictures of them, and truthfully I can’t even remember if I owned a camera, or if anyone in my family did. 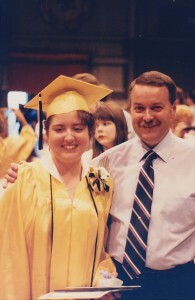 High school graduation day! That’s me and my dad, who passed away in 1998. Helloooo prednisone moon face on me. 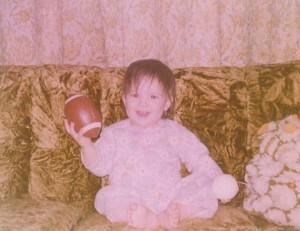 People often think I was overweight in this photo. I actually weighed about 100 pounds, which was a vast improvement, but still very unhealthy. There are a few pictures from my last months in high school, when I was trying desperately to stay out of the hospital. I actually refused to go back, and my physicians allowed me to take high doses of prednisone at home so I could finish out the year. So, yes, I went to graduation and prom with my face looking like a bowling ball. And there are some photos. I remember it was hard to smile — my cheeks just wouldn’t allow my mouth to move that way. And no one would have suggested we take photos outside of a major life event. “Let’s document this for the future!” What future? Why? Who would want to remember this? I didn’t even know if I had a future, to be perfectly honest. I had so little information at the time, and didn’t even know what to ask. All I knew was that this thing wasn’t going away and most people didn’t take it seriously. It felt like a dirty secret, and I kept it all to myself. Even now, as I finally tell my story in bits and pieces, memories that I buried so deep burst out and surprise me with their overwhelming desperation and bitterness. That’s not healthy. So — let’s not do that anymore, k? Thinking back on it now, it feels like the dark ages. Of course, we didn’t know the world would open up to us in the way that it has. That I would be able to communicate with IBD patients all over the globe, and even meet people whose disease story mirrors my own. People I never would have met in any other way. I thought I would have to write a print book in order to do that in even a tiny fraction of the way I’m able to do on the Internet. How did we get along then, being so isolated? Well, we didn’t miss what we didn’t have. If you were to take my Internet away today it would be a different story. I suppose we would all adjust over time, but I would be so worried about my online IBD family and the newly diagnosed patients who are overwhelmed by their diagnosis. 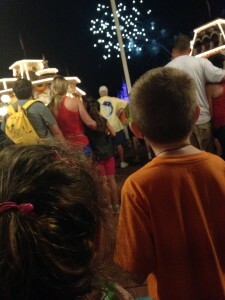 My view as I watched the fireworks at Disney’s Magic Kingdom with my two kids. So, important things about this: (1) I HAVE TWO KIDS! (2) I WENT TO DISNEY! I’m now well enough to do some actual living, in the world, with people and stuff! This is why I implore you to share, or if you’re already doing it, keep up the good work. It’s not easy — who on this Earth is comfortable sharing a photo of their scarred belly or their face when they are in pain? But remember that for every person who has nothing nice to say to you, there will be 10 who will support you and lift you to heights you never imagined. And you will reach that one person who is at the end of their rope with their IBD, who is really struggling and who needs your help. I can’t wait to see what you do. Because it’s going to be great. I kept my disease private until just recently. I didn’t want to be penalized for having an unpredictable chronic illness even though until I had surgery I never missed a days work because of it. However I’m now breaking my silence and going public because I’m cycling across Canada to raise money and awareness of the disease.